The Provincial Council of Florence, Italy unanimously passed a resolution on the protection of religious freedom in China on June 27, 2012. It calls for an end to the persecution of Falun Gong, and an investigation into the disturbing reports of organ harvesting from living Falun Gong practitioners. 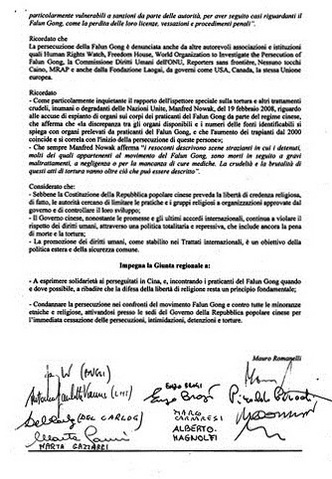 The resolution was drafted by Massimo Lensi, member of the People of Freedom Party. The resolution states that the persecution of the Falun Gong movement must stop, and comprehensively defends the freedom of religious belief in China. The provincial council unanimously passed the resolution presented by the provincial Committee of International Relations. 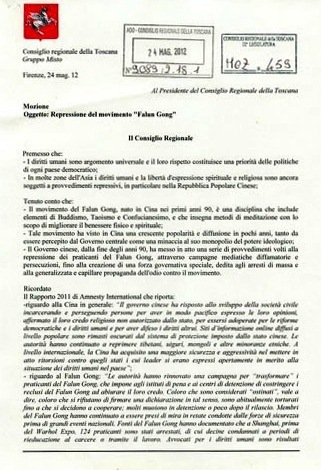 The resolution calls upon the Italian Government, in particular the Minister of Foreign Affairs, to send a note to the Chinese Communist Party's diplomatic missions that they should clarify to the international organizations about the disturbing allegations--in particular regarding the organ harvesting from living Falun Gong practitioners--and immediately stop the persecution, threats, detention, and torture of Falun Gong practitioners and all other religious believers. The resolution also requires the provincial chairman to meet with Falun Gong practitioners' representatives, to express the provincial council's sympathy and support for Falun Gong practitioners, and provide an appropriate venue for them to hold an International Truthfulness-Compassion-Forbearance Art Exhibition. The Florence Committee on International Relations held a human rights hearing on April 24, 2012, and members of the Falun Dafa Association explained the situation of the brutal persecution of Falun Gong practitioners by the Chinese Communist Party (CCP) in China. The Falun Gong movement originated in China in the early 90s, aiming to improve people's physical and mental health. The district council is located in bustling downtown Florence, so Falun Gong practitioners had opportunities to speak with passersby and tourists from around the world about Falun Gong and the persecution. An overseas Chinese student took a copy of informational material and read it right away. He told the practitioners that he knows that the CCP's slanderous reports on Falun Gong are false. Finally he thanked the practitioners for informing him of the true situation.